If you find yourself in agreement with this ugly graphic (I mean really, who designed this? ), you need to read this. This image was posted by right-wing Facebook group 100 Percent FED Up. I’m not really sure what the purpose of fully capitalizing the word ‘FED’ is – maybe because those actually benefiting from Republican policy are DEFINITELY not hungry? You know what I’m fed up with? People judging. Making assumptions. Hating. Placing blame. I urge you to step back and think about what this graphic is really saying before you nod in agreement, because how we relate to each other becomes the basis for public policy. It drives social services, electoral reform, education, labour law, tax law, etc. It affects us all. The main concern of the graphic above seems to be the question of responsibility. It raises a valid point that there are things an individual can do to affect their situation. There are ways you can make a bad situation worse or better. There are people who have risen above poverty through their own determination. Personal responsibility is ours to take. And taking responsibility doesn’t mean accepting blame for things outside of our control; it just means accepting the fact that you always have a choice, even if only in your attitude. Let’s look at the claim above a little more closely. 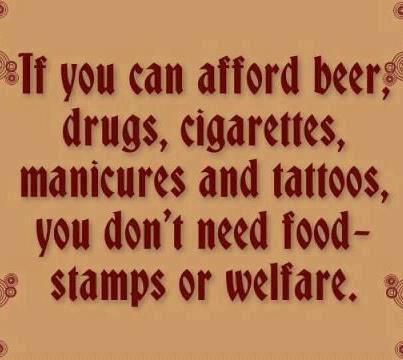 Is it true that if you drink booze, smoke cigarettes, take a hit, get your nails done or get inked, you do not need social assistance? Maybe. That’s the only honest answer you can come up with. The implication, therefore, is that the claim rests on assumptions that anyone in agreement is choosing to ignore. How’s that for taking personal responsibility? Take the example of a welfare recipient who smokes cigarettes. Regardless of financial standing, people continue to smoke knowing how tremendously bad it is for them. Granted, smokers often shield themselves from learning the specifics (I once stood in line behind a young lady who asked the clerk for a different pack of smokes because she wanted one with a less horrifying picture on it) – but the reason they smoke goes beyond moral ineptitude or weakness; nicotine is a very addictive substance. The fact that money is harder to come by for poor people does not override any chemical dependency they may have – and to expect them to be able to quit because they’re poor is ridiculous. Do you think an alcoholic on welfare is going to think, Gee, this costs x amount of money each month, which the taxpayers are shouldering, so I should just snap out of it? Addicts have characteristically low self-esteem and their addictions often further erode any self-sufficiency and confidence they had to begin with. Not to mention the disastrous effects of cuts to drug treatment programs; these services are crucial in preventing both crime that is directly related to the drug trade and crime committed in order to fund addiction. This is but one example of how drug policy affects the poor in real ways. The war on drugs (a massive failure, now to the admission of most world leaders) is inspired by an understanding (or lack thereof) of the particular struggles faced by those most at risk of being affected by the drug trade – namely, the poor and ethnic minorities. Getting back to the power of assumptions… Let’s say you overhear a person talking about the welfare they receive and you notice that they got a manicure and have tattoos. I understand your point if this seems questionable. I really do. But does it give you a basis for believing that they would not need social assistance if they hadn’t gotten a manicure or tattoos, and that you can make that determination for not only this person but any and every welfare recipient who has gotten a manicure and tattoos? Let’s say you know for a fact that a particular person would make enough money to support themselves if they didn’t spend their money on such-and-such. In that case, they’re clearly abusing the system. But again, they do not represent other individuals who make their own choices and have their own circumstances to contend with. It’s also worth pointing out the sort of expectation we’re placing on a person who goes hungry or has insufficient nutrition, has had substandard education, lives in a neighbourhood rife with drugs, crime and violence, has limited access to healthcare and health insurance and doesn’t have decent shelter or clothes to wear to a job interview (if one is offered). If you consider the stressors experienced by such an individual, you might forgive them a toke, a beer or a trip to the salon. Prematurely judging one person – and everyone else you lump into the same category – is making a huge leap. Not only is it unfair; it’s illogical. Besides, if we’re going to judge, how does the average person compare? The only difference between a welfare recipient who lives beyond their means and a gainfully employed person who lives beyond their means is that the welfare recipient doesn’t have good enough credit to borrow money. Let’s say you’re a working person who lives above the poverty line but has accumulated so much personal debt that you have to declare bankruptcy. Your creditor can’t get that money out of you so they write it off, which means they no longer count the money you owe them as an asset. Assets on which they no longer have to pay income tax. Tax money that would have ended up in the public purse. I suspect a lot of people don’t realize this. Here’s another problem with judging others as unworthy of social assistance: it gives your government a justification to deny help to the people who do need it – without having any idea whatsoever of how many of these people might be abusing the system. Does that make sense to you? In a democratic society, are we supposed to let assumptions and trajectory drive public policy, or are we going to make important decisions that affect the most vulnerable with openness, rationality and honesty? The most troubling implication of the reasoning of the above claim is that fundamentally, it’s the same type that’s used to form arguments that are racist, sexist or otherwise discriminatory. It’s like watching an obese person walking into McDonald’s and thinking, ‘That must be why they’re fat’. If that person orders a mango smoothie and tells you they’re taking their daily walk and have already dropped 50 pounds, what does your assumption say about you?